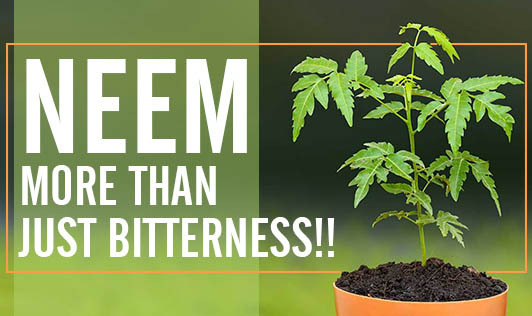 Neem- More Than Just Bitterness!! Do you use this magic leaf only once a year on a festival day? Let me give you some good news about our classic historic leaf which has been used as a medicine for many years. Neem is known to have originated from India and Burma. Every part of the neem tree such as the bark/fruit/flowers/seed has been used in ayurvedic medicine. One of the fascinating facts about Neem is that it not only fights infections but also boosts immunity without destroying healthy bacteria in our body. • Neem tree branches are still used in our country to clean teeth. It's anti-inflammatory, anti-allergic and anti-septic properties help in protecting gums and teeth, and keep them healthy. • Its anti-inflammatory properties are beneficial in treating arthritis and other ailments that affect the joints. • Neem paste when applied on hair helps in treating hair loss, dryness and promotes growth of shiny hair. • Proven to boost your immunity. • Adding Neem leaves to your water bath helps protect you against harmful germs. • Neem leaf paste along with turmeric when applied on the face clears acne marks and prevents pimples. • Neem leaf water extract has shown significant antiulcer activity. • Neem leaves can be used for preservation of food grains like rice, lentils and wheat. Make sure the leaves are replaced every 2 - 3 months. • They are extensively used as a natural pesticide. It is commonly used in alternative medicine; there are many ongoing studies on neem and its benefits in diabetes and its anti cancer properties. If you are planning to include neem, start by trying a little to make sure you don't show any allergic reaction to it. Avoid eating Neem if you are pregnant or planning for pregnancy. Definitely, neem is a magical cure and can be a good home remedy for several problems, but make sure you use it sensibly.